Shares of airlines, railroads and shipping companies are climbing, a bullish sign the U.S. economy is on strong footing and the broader stock market can continue its recent march higher. 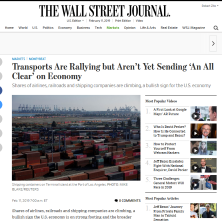 Transportation stocks are viewed as a barometer of economic activity because those companies carry the raw materials and goods that power manufacturing. The Dow Jones Transportation Average, which tracks the performance of 20 stocks ranging from American Airlines Group Inc. to Union Pacific Corp. to FedEx Corp. , has jumped 18% from its Christmas Eve low. That has outpaced the 15% advance by the Dow Jones Industrial Average. Proponents of the century-old Dow Theory believe that strength among the transports is a positive indicator for the economy and broader market. But, after the fourth quarter’s bruising selloff, some investors say they are still waiting for further evidence of a rebound before jumping back into the stock market.